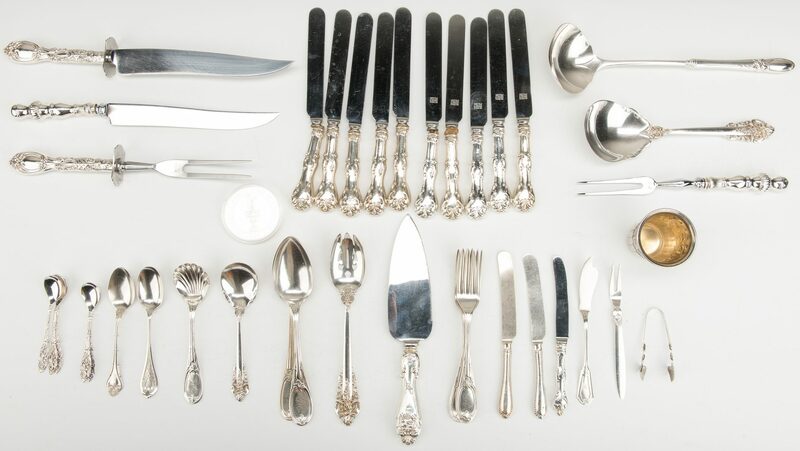 42 items total including 37 pcs sterling silver flatware, jigger, and silver coin. 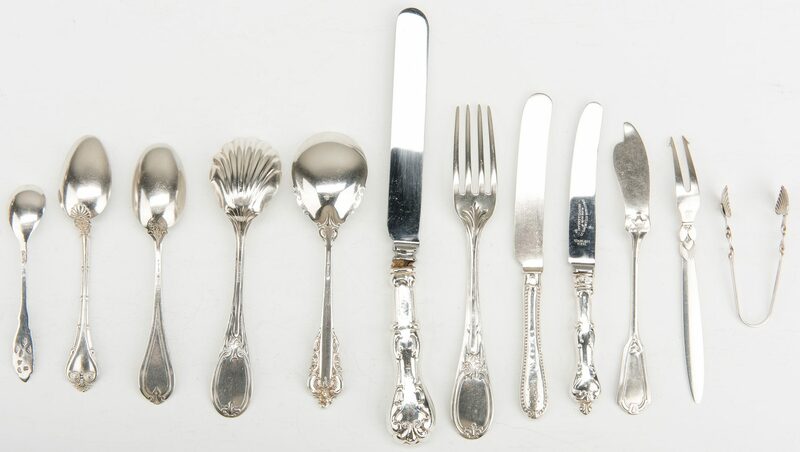 1st-3rd items: 3 pieces Wallace Grand Baroque pattern flatware, including 1 sugar spoon, 1 pierced tablespoon, and 1 salad serving spoon. 4th-11th items: 8 pieces John Polhamus Louis XIV pattern flatware, including 4 dinner forks (7 3/4" L), 1 sugar shell, and 3 tablespoons. All pieces monogrammed "GSC". 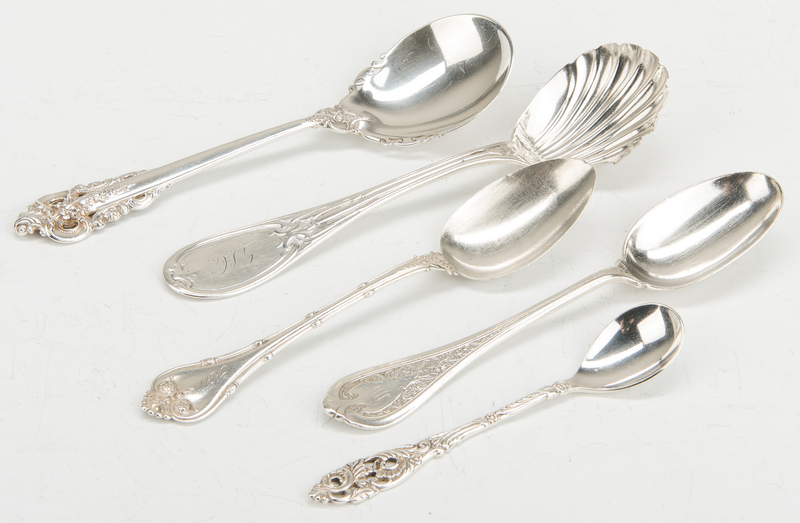 12th-16th items: 5 Gero Sterling demitasse spoons (4 1/2"L). 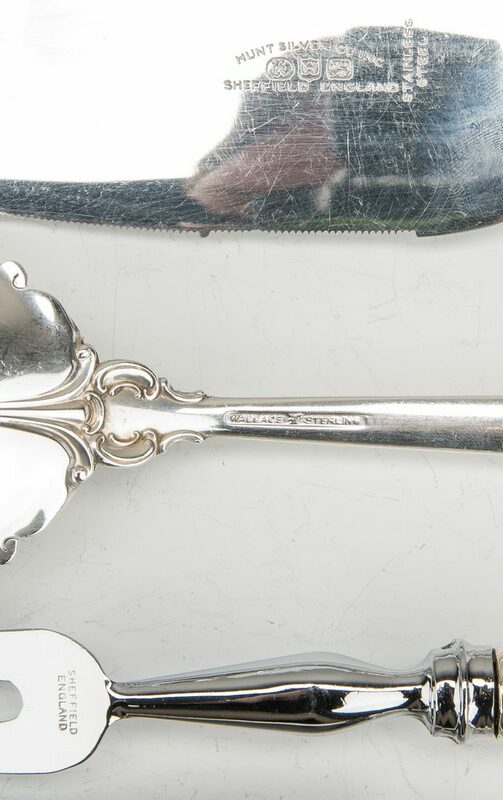 17th item: 1 Georg Jensen Cactus pattern short handle pickle/olive fork (6 1/8" L). 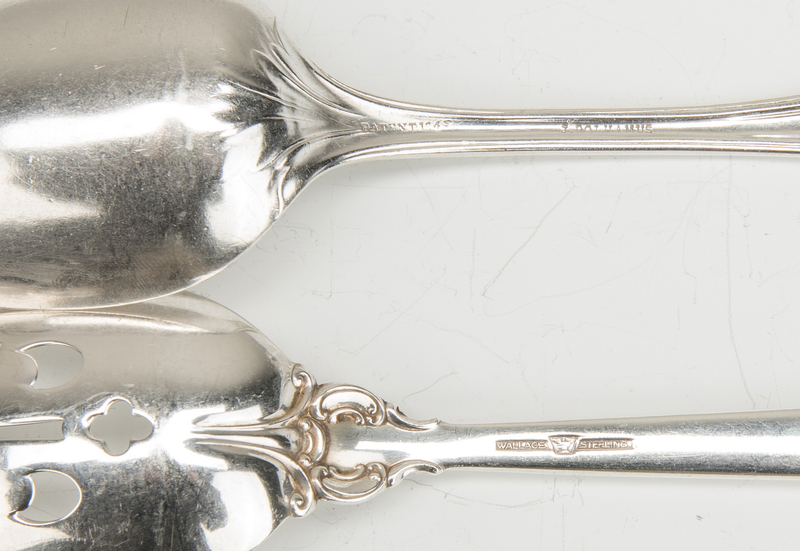 18th item: 1 William Moir teaspoon (5 7/8" L). Monogrammed "PWC". 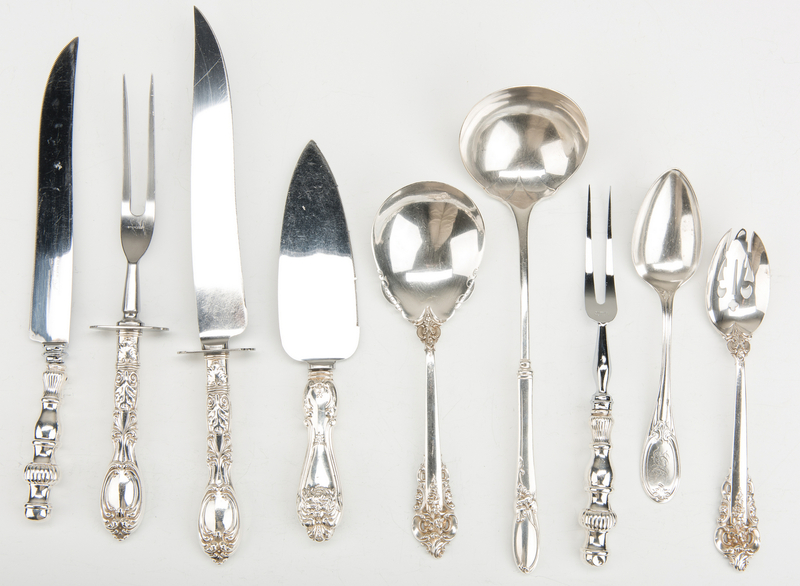 19th-20th items: 2 pieces Whiting Co. silver, including 1 New Empire pattern teaspoon (5 7/8" L), monogrammed "KW", and one Keystone pattern master butter knife, monogrammed "H". 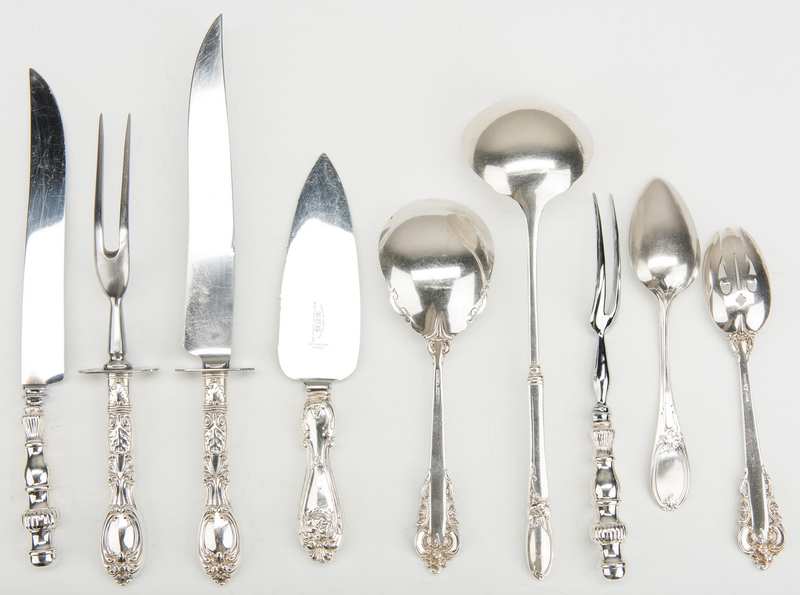 21st item: 1 Frank M. Whiting Co. 2-piece carving set, including 1 carving fork and one carving knife. 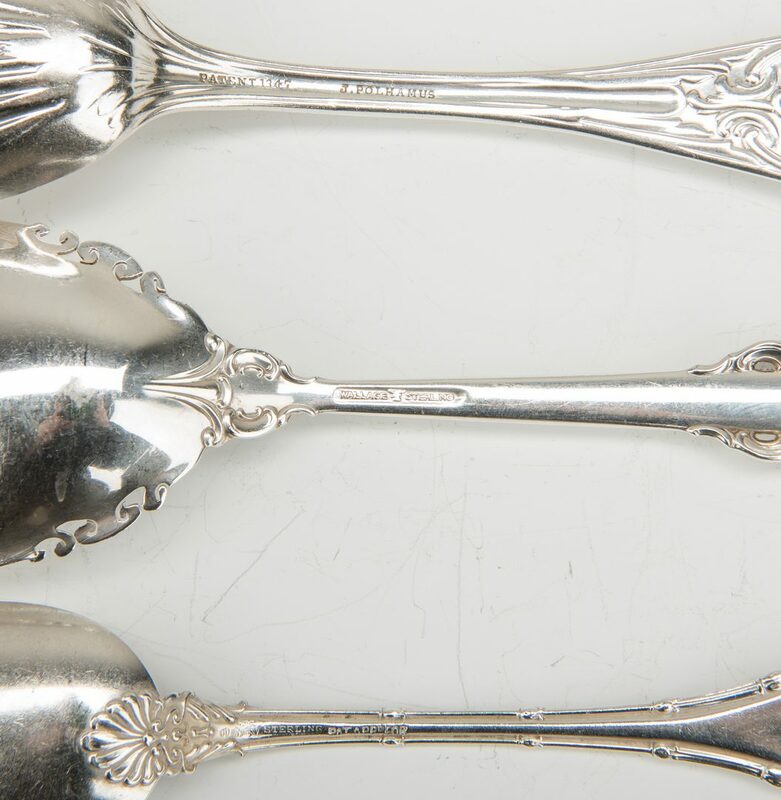 22nd item: 1 Raimond Silver Manufacturing Company sugar tongs. 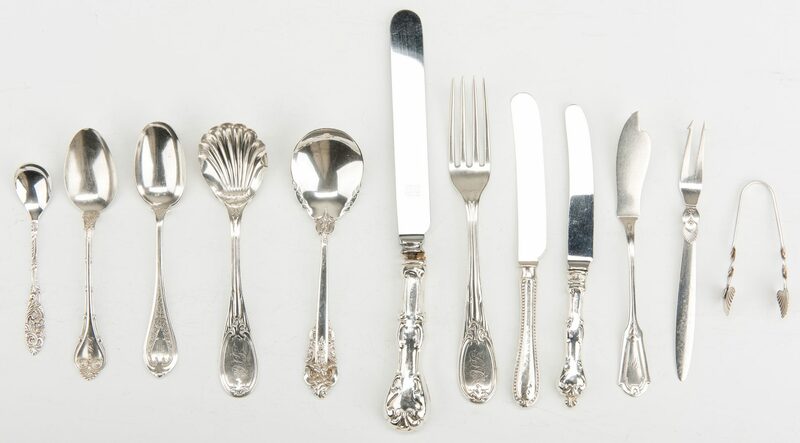 23rd-37th items: 13 pieces assorted Sheffield England flatware, including 1 Ambassador Cutlery hollow handle butter spreader, 1 Hunt Silver Company Inc. pie/cake server, 1 carving fork and matching carving knife, and 10 hollow handle dinner knives. 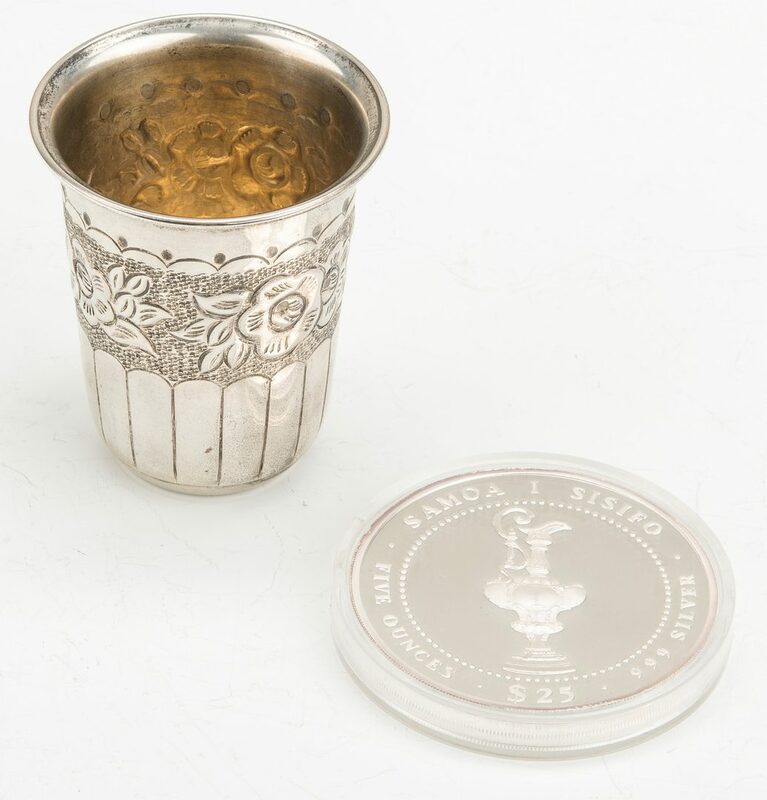 38th item: 1 Ezada 925 Israeli jigger with repousee floral band above vertical lines. 3" H x 2 5/8" dia. 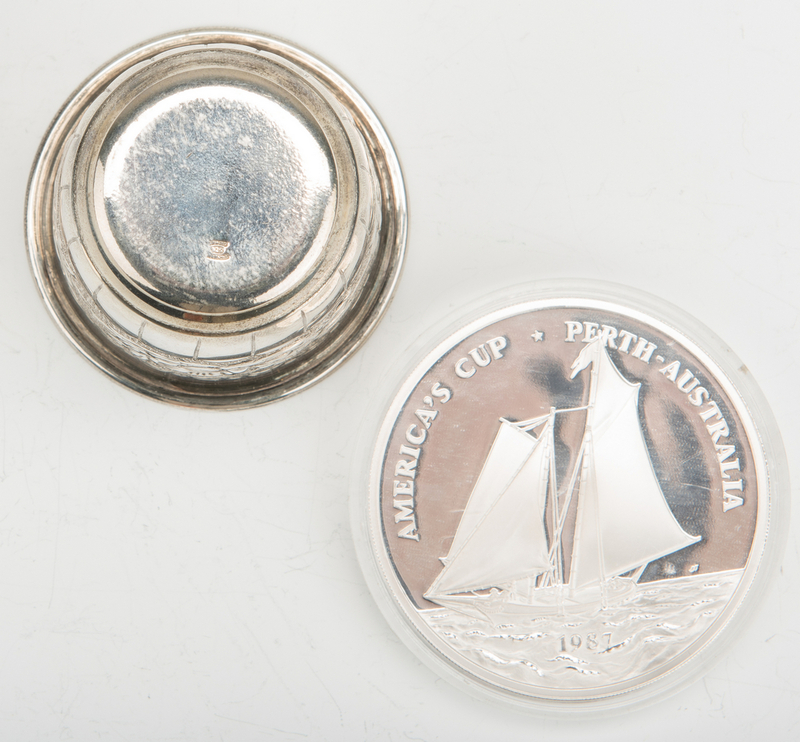 39th item: 1 America's Cup Perth-Australia Samoa I Sisifo $25 coin, marked Five Ounces, 999 Silver. Housed in a plastic coin case. 2 3/4" dia. 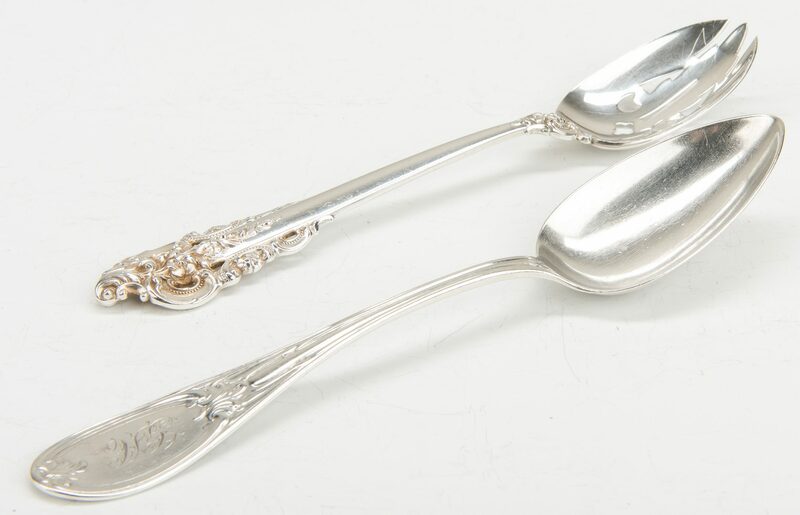 40th-41st items: 2 hollow handle butter spreaders. Not marked sterling. 42nd items: 1 weighted ladle. Not marked sterling. 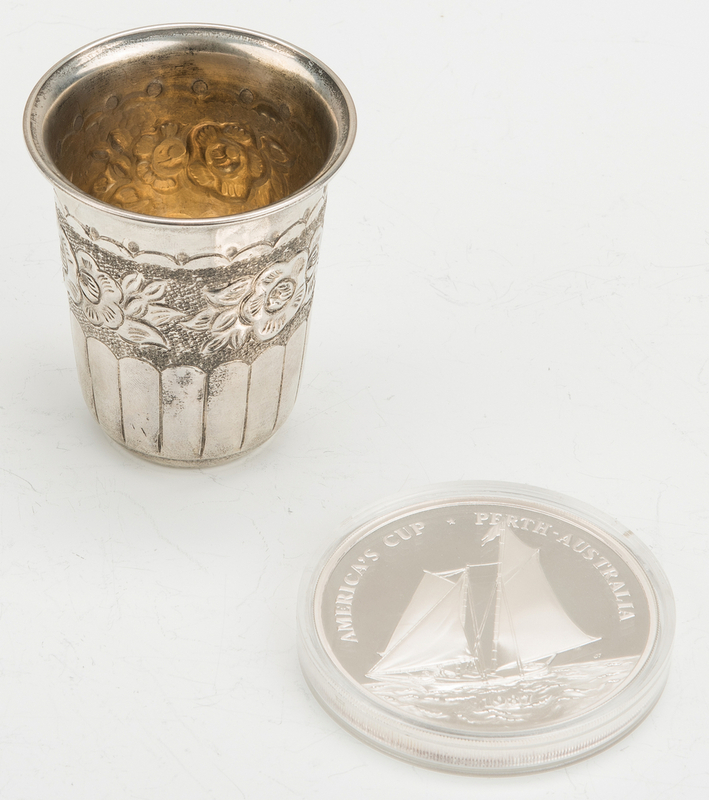 30.18 total weighable troy ounces. CONDITION: Overall good condition with with some surface scratches. 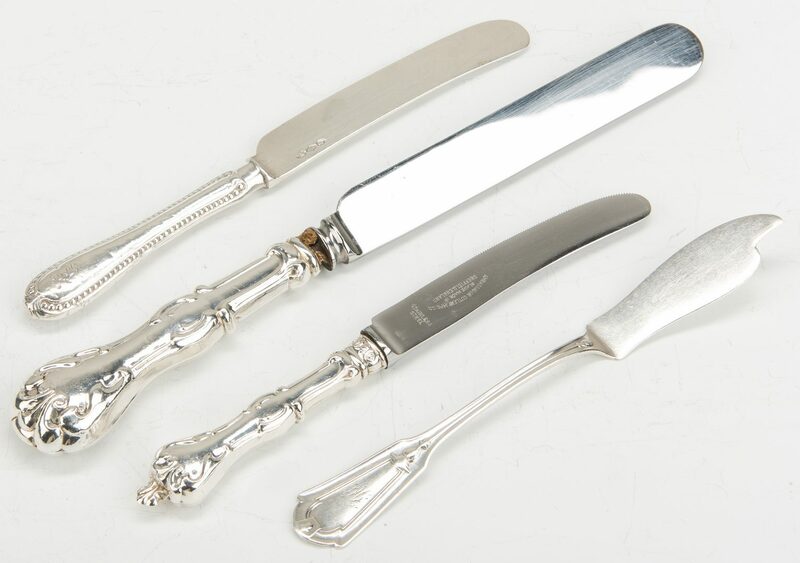 6 of the Sheffield England hollow handle dinner knives with repairs to top of handle. Monograms to 4th-11th items, 18th item, 19th-20th items, and 40th-41st items.